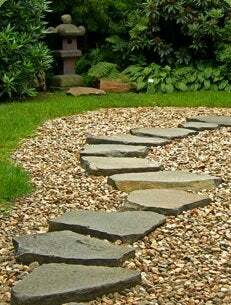 Create a simple stone path to enhance your yard and set a distinctive walkway. Examine your lawn and note where the grass has been regularly traversed and has worn down to natural path. 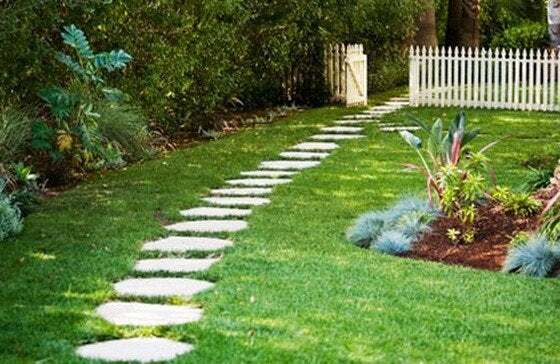 This is the ideal place for your stepping stone walkway. Determine the placement of the stones so they align with an average person’s comfortable walking stride. Walk along the path and place spikes where the center of your foot lands at each step as you move along the path. Use a wheelbarrow to carry natural flagstones or manmade patio pavers to each stake. Remove the stake and center the stone or paver atop each spot. Using a long utility knife or a garden trowel, carve a line around the perimeter of the stone. Remove the stone and dig out a layer of sod, removing soil so that the hole is about an inch deeper than the depth of the stone. Make the bottom of the hole as flat as possible. Pour a 1/4- to 1/2-inch layer of crushed limestone or coarse sand on the bottom of the hole, packing it down and making it is as flat and level as possible. Use a level to see that the bottom is flat and level. If you’re using coarse sand, you may moisten it with a fine spray of water to help tamp it down and pack it tightly. This layer will keep the stone from sinking over a period of time. Now place the stepping stone into the hole and press it into the packed material. Then pack a little more of the loose sand or crushed stone around the stepping stone to give it some added support. Tap the stone with a rubber mallet or stand on it to set it in place. Repeat steps 3 through 5 until you’ve completed your path.